Mixed Vegetable Curry is an easy and simple dish made with a medley of fresh veggies and seasoned with simple spices. Mixed vegetable masala curry goes well with plain rice or hot chapathis. 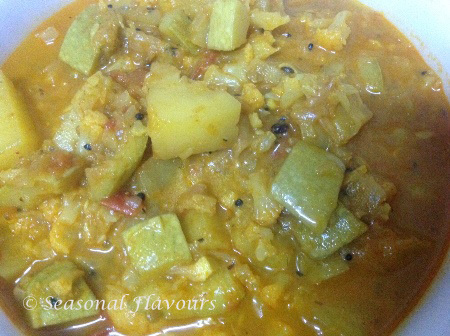 Mixed vegetable masala gravy curry without coconut is a tasty vegetarian Kerala curry made with assorted vegetables. Mixed Vegetable Curry is a delicious mix of colourful vegetables. A tasty and nutritious vegetable curry preparation. 1. To prepare this easy vegetarian recipe, cut the vegetables into ½ inch square pieces. 3. Toss in all the 5 spices mentioned (1-5) above. The mustard will splutter immediately. Stir the spices for about a minute on low flame. 4. Toss in crushed garlic, onion and tomato and sauté for about 2-3 minutes. 5. Add the turmeric powder, coriander and chilli powder to the mixture; cook it for about 1 minute. 6. Toss in the vegetables, add salt and mix well. Close the lid and cook on low flame for about 3-4 minutes. 7. Add about ½ cup of water and mix well. Cook until the vegetables are soft. 8. Garnish with coriander leaves and serve Mixed Vegetable Masala Curry with chapathis. If you are looking for more vegetable recipes, do try out Vegetable Rice and Vegetable Upma. Mix Veg Curry is a healthy combo of vegetables that makes the dish both colourful and appealing. This Kerala Vegetable Masala Curry can be rustled up in a jiffy. Wash and cut all the vegetables into ½" pieces. Add fenugreek, mustard, cumin, aniseed and onion seeds. Saute for a minute or two on a low flame. Tip in crushed garlic, chopped onion and tomato. Stir-fry for 2-3 minutes. Sprinkle turmeric, coriander and red chilli powder. Mix well and cook for a 1 minute. Add the cut vegetables and salt to taste. Combine well and cook covered on low heat for 3-4 minutes. Add ½ cup of water. Stir and cook until the vegetables are tender. Garnish with coriander leaves and serve Mixed Vegetable Masala Curry with Rice or Rotis.